Believe it or not, Hops & Hominy was in yet another San Francisco alley, albeit not the same one as Gitane, Cafe Claude, and Claudine. Considering my good luck with alley dining, I may never nosh at an establishment on a well-lit main street again! 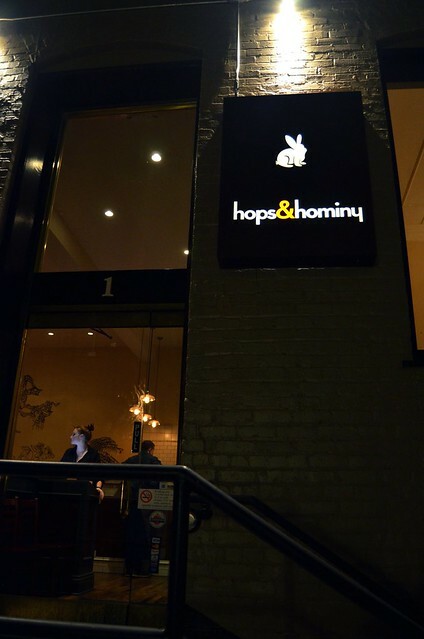 Hops & Hominy brings a little piece of the South to the Bay Area. Our table of four was quite pleased with our dinner, which was impressive in light of the fact that the restaurant had just opened two months ago. 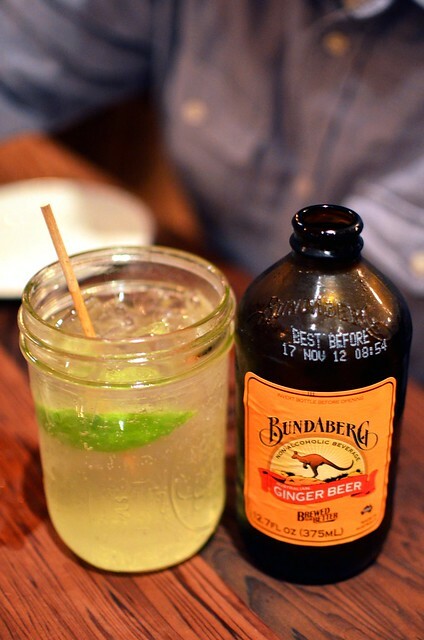 Always a solid non-alcoholic choice! 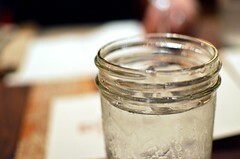 Served in a Mason jar! 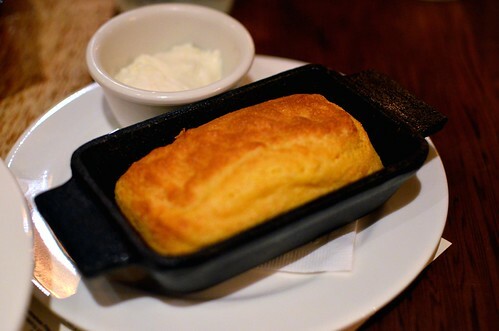 Complimentary cornbread with honey butter. Hot, hot, hot and made even better with the delectable light whipped honey butter. 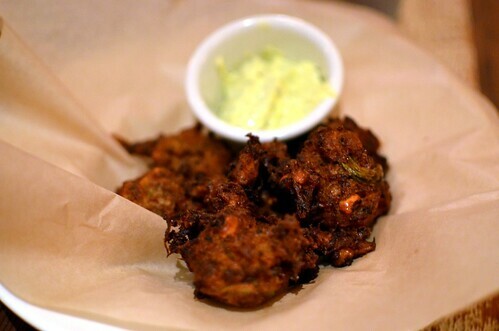 Black-eyed pea fritters, herb aioli ($8). Unexpectedly epic. They don't look like much, but whoa! Fantastic! 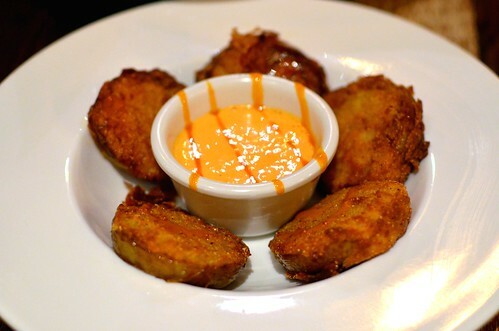 Fried green tomatoes, spicy buttermilk dressing ($8). 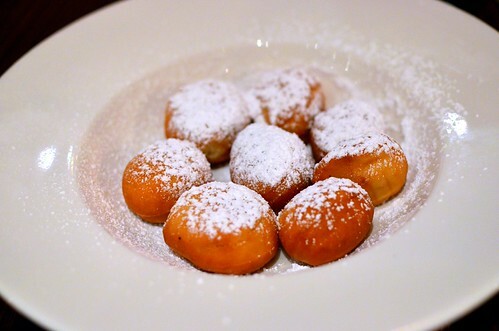 Sadly, these were overshadowed by the black-eyed pea fritters. Good but not at all awesome. Pacific salmon pan-seared, broccoli and roasted pepper risotto ($25). Our friend ate all of this. All of it. We thought he was going to pick up the plate and lick it. Deep water shrimp and cheesy Southern grits ($19). 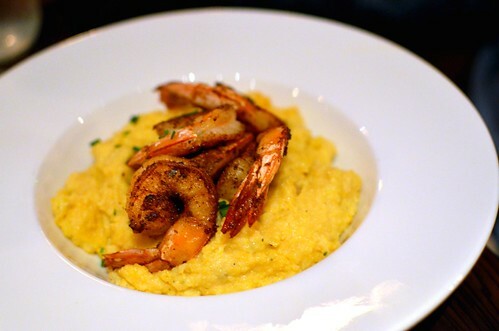 The shrimp was smoky with a hint of kick, and the grits were steeped with cheese as promised by the menu description. 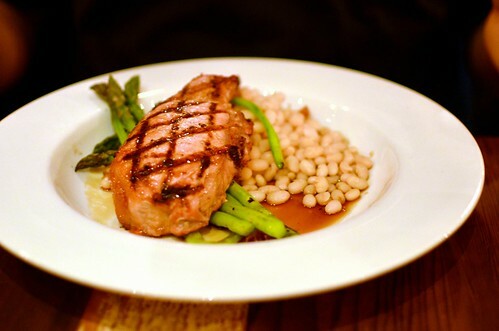 Thumbs up for Mr. Monkey's dish! 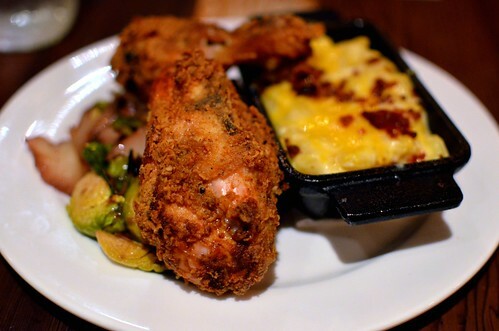 Buttermilk battered chicken, mac 'n' cheese with bacon, Brussels sprouts ($19). My friend and I were the big winners with this entree! Oh my gosh! Crunchy, well-spiced, and juicy chicken! Super rich and meaty mac! Gorgeous Brussels! Worth tons of exclamation marks! 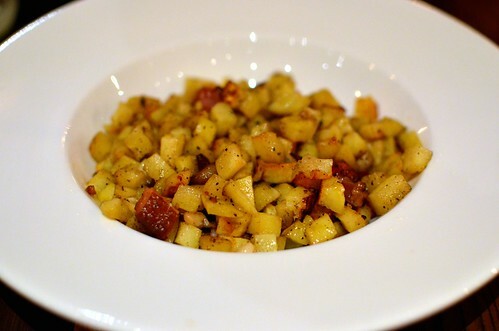 Sweet potato hash cubed, house-cured bacon ($6). We all really enjoyed this side dish. I'm not exaggerating when I say our friend nearly buried his face in this bowl. Cherry-apple cobbler a la mode. 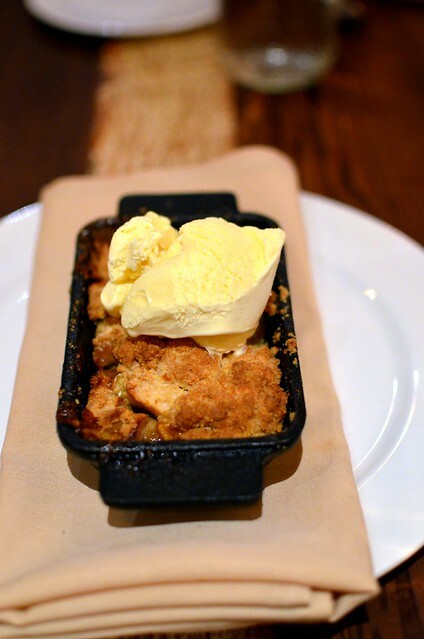 Everything you could ask for in a dessert -- sweetness, tartness, heat, cold, crumble, and cream. We fought each other with our spoons for this. Disappointing if only because they looked so amazing. I thought they could be sweeter. Perhaps a dipping sauce could help. It wasn't a perfect meal. There were some slow service issues. 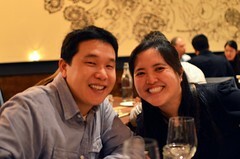 There were a few weaker dishes. But, overall, I would still happily recommend Hops & Hominy to you. 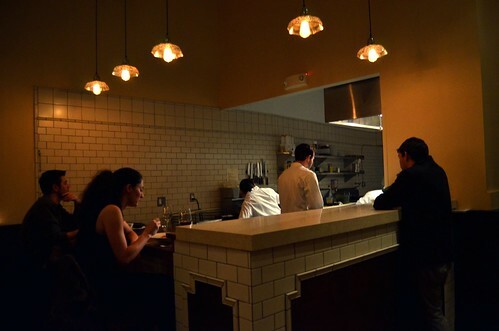 I think the young restaurant has a lot of potential and is on its way to excellence. 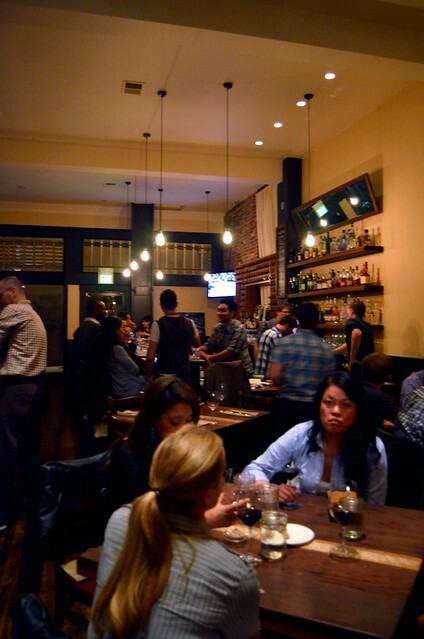 You should add Belden Alley to your list of SF dining alleys. One of the cutest restaurant name and logo I've laid eyes on! everything looks rich. and delicious.